I’ve been travelling with my Victorinox Spartan for more than three years and I’ve used it a lot, so I think I’m suitably qualified to write this Swiss Army Knife review. I know what the Spartan can and cannot do and I’m confident it will still be a valued travelling companion many years from now. In fact, I’m anticipating have it alongside me for the rest of my life. Make no bones about it, Victorinox Swiss Army Knives are very well made. They are quality items that are built to last. They have to be because the company offers a lifetime guarantee. That means if there are any defects in the materials used or in the workmanship, Victorinox will either repair the knife free of charge or replace it. However, that’s all the guaruntee covers. If you decide to take up knife throwing, start using your knife as a prying bar, or abusing it in other ways the guarantee will be void. This Victorinox Spartan Swiss Army Knife review will also be equally applicable to the Victorinox Tinker. Both knives are essentially the same. The only difference is the Tinker has a Philips screwdriver. The Spartan has a corkscrew instead. I chose the Spartan because I find a corkscrew more useful than a Philips screwdriver and, should I need to do anything that involves cross-headed screws, there is 3mm screwdriver blade on the end of the can opener and, in my experience, it usually does the job. However, if a Philips screwdriver is more important to you than a corkscrew you may want to reconsider your options and think about buying a Victorinox Tinker instead. 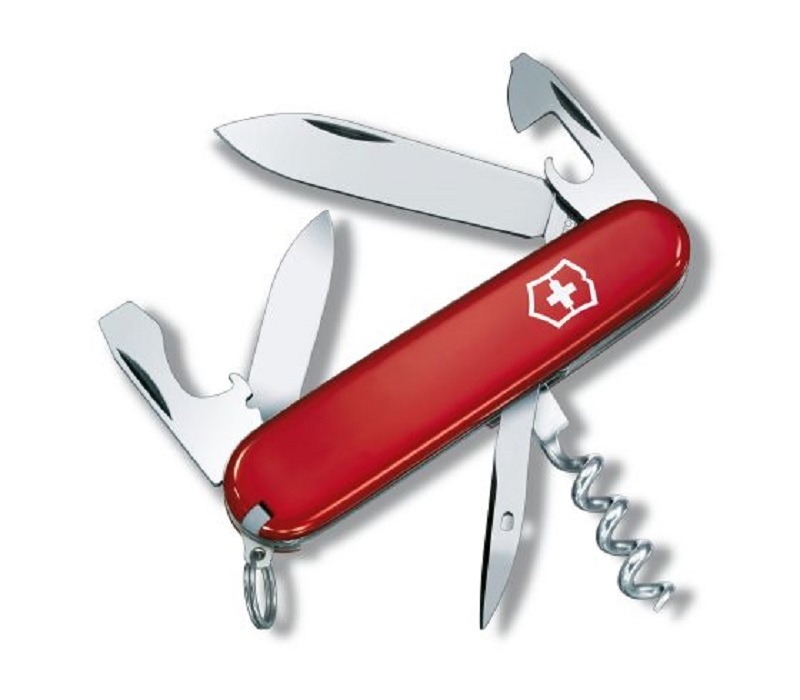 Victorinox offers many Swiss Army knife options. There are a lot of tool combinations available and, if you don’t mind having all that extra pocket bulge in your pants some of the bigger knives provide a crazy number of tools. A Swiss Champ XAVT has 82 tools and serves 83 functions, but to my mind, an option like that is better classed as a multi-tool than a pocket knife. I don’t need a knife like that. I’m a minimalist I like to keep things simple. When I decided to buy a Swiss Army Knife, I went to a shop that had all the different options and, although some of the slightly larger knives were a little tempting, I chose the Victorinox Spartan because it’s nice and compact but still offers a lot of functionality and has all the tools I’m likely to need. The blades and other tools are made from high-quality stainless steel, so there is no need to worry about rust and, even though I’ve used the two blades on my knife a lot they have remained nice and sharp. The large blade is around 70 mm long. It’s a personal choice, but I only use that one for food. The smaller blade is around 40 mm long and I use that for cutting everything else. I use the corkscrew from time to time and never regret buying the Spartan instead of the Tinker. Obviously, the corkscrew is not as strong as the kind you would buy especially for uncorking wine bottles, but it has never let me down. The combined reamer, punch, and sewing awl, lies behind the corkscrew. To be honest, I never anticipated having a need to use it, but I was wrong. I’ve found it comes in handy when I lose weight and need to add a few extra holes to my belt. I’ve used the can opener a lot and have occasionally used the small screwdriver blade on the end of it for tightening up or removing cross-headed screws. It works okay. The toothpick is actually the tool I use most of all. I generally use it every day. Often more than once. It’s incredibly handy. The tweezers aren’t particularly sturdy and I can’t remember the last time I ever used them. In fact, I may not have used them at all. I’ve let people other borrow them a couple of times to remove splinters from their hands and was actually quite surprised when I was told that the little tweezers work just fine. The key ring on the Victorinox Spartan is made of sturdy stuff, but it’s too small to be functional. I don’t see the point of it. Anyone who wants to clip their keys to their knife will need to loop a larger key ring through it. I’ve never done this, but I did once have a clip attached to it so I could hang my knife from the belt loop on my pants. Having said that, if you have a key for a really tiny padlock key or something of that nature, the small key ring may offer some value. I like the Victorinox Spartan. 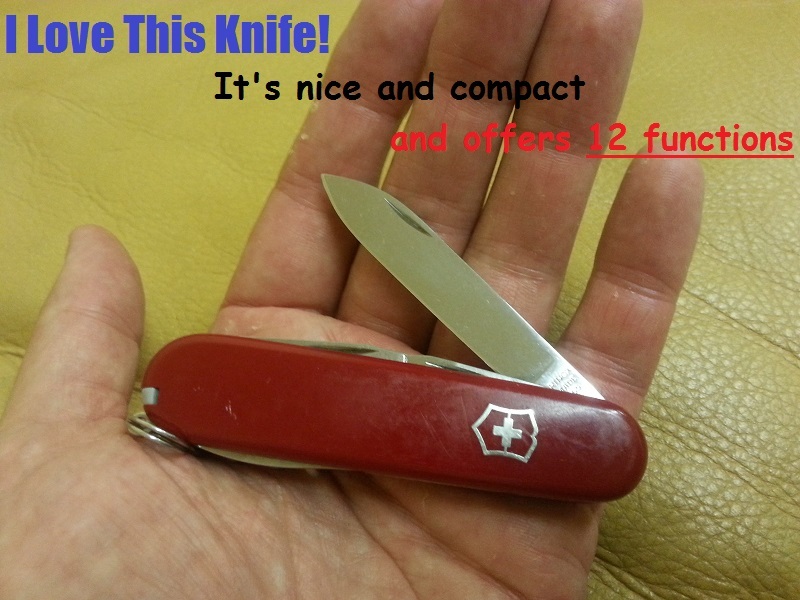 If I didn’t I probably wouldn’t have taken the time to write this Swiss Army Knife review. I’d rather write about something I feel positive about than slam products I feel have let me down. When I originally bought the knife. I looked at the functions it offers and the size and decided it was the perfect choice for me. Time has proved me right. I know some people may need a bigger knife with more functions, and others may want something smaller and less complicated to use as an occasional cutting tool. However, if you are looking for good knife to take on camping trips or a handy, unobtrusive tool that won’t weight your pants down, is easy to forget until a need for it arises, and is capable of handling most tasks you are likely to find, the Victorinox Spartan is a very good choice. 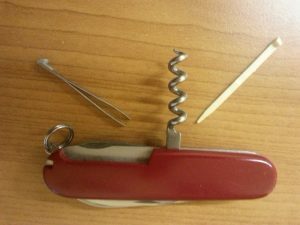 As is the Victorinox Tinker, unless you need to uncork the occasional bottle of wine and the fact that neither option is overly complicated means they are two of the cheapest Swiss Army Knives in the Victorinox range.